Emotions are often described in mind-body medicine as “e-motion”: energy in emotion. They are present to tell a story about what we need to pay attention to – an inner reflection of what is happening in our lives. Unfortunately, some emotions get labeled as being ‘negative’ and end up conveniently tucked away so that the conscious mind does not have to be present to discomfort. Since emotions are physiologically represented in our bodies (patterns of neurological activity, as well as patterns of immune system and hormonal/endocrine activity, etc. ), the suppression of our emotions has simultaneous physical and psychological ramifications. In the linked study, beliefs about emotion, coping styles, and their connection to anxiety/depression and fatigue were examined. Essentially, the message is that when we relate poorly to some or all of our emotions, especially the one’s we’ve labeled as bad or negative, we isolate and are harder on ourselves. In contrast, when we cultivate a healthy relationship to our feelings and interact with them with the attitude that they carry important energies, truths, and meaning, we can reduce our risk for anxiety, depression and fatigue. 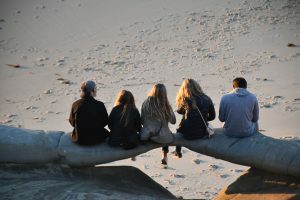 While the study did not find that the relationship between beliefs and depression, anxiety, and fatigue were mediated by social support-seeking, there is a solid scientific foundation for the argument that social engagement and prosocial behavior is bi-directionally linked to health and disease, and ultimately the quality of our relationships is reflected in our physiology. Mind-body medicine that supports self-regulation, self-awareness, and self-expression, can enhance our capacity to cultivate and engage in healthy relationships with others.